New Delhi April 16 (IANS) Deflating food prices softened India s wholesale price-indexed (WPI) inflation to 2.47 per cent in March from 2.48 per cent reported for the previous month official data showed on Monday. According to the Commerce Ministry data the WPI inflation in March 2017 was more than double at 5.11 per cent. "The annual rate of inflation based on monthly WPI stood at 2.47 per cent (provisional) for March 2018 (over March 2017) as compared to 2.48 per cent (provisional) for the previous month and 5.11 per cent during the corresponding month of the previous year " the ministry said in its report. On a sequential basis expenses on primary articles which constitute 22.62 per cent of the WPI s total weightage inched up by 0.24 per cent from an increase of 0.79 per cent in February. On a year-on-year (YoY) basis onion prices soared higher by 42.22 per cent whereas potato prices rose by 43.25 per cent. In contrast the overall vegetable prices in March deflated (-)2.70 per cent against a fall of (-)0.50 per cent in the same month a year ago. Similarly the protein-based food items such as eggs meat and fish became cheaper by (-)0.82 per cent during the month. Prices of the other major group under the WPI manufactured products which comprise nearly 64.23 per cent of the index recorded a 3.03 per cent rise. In addition the cost on fuel and power category which commands a 13.15 per cent weightage in the index increased at a slower pace of 4.70 per cent from a growth of 22.35 per cent YoY. Product-wise the price of high-speed diesel rose by 6.12 per cent during March while that of petrol climbed by 2.55 per cent and for LPG by (-) 9.08 per cent. On April 12 the data released by the Central Statistics Office (CSO) showed that lower food prices eased March retail inflation to 4.28 per cent from 4.44 per cent in February 2018. However on a year-on-year (YoY) basis the consumer price index (CPI) last month stood higher than the 3.89 per cent reported in March 2017. According to industry body PHD Chamber the consistent decline in WPI indicated "that the government has undertaken effective measures at the ground to address the supply side problems of the economy during the last few years". "A significant decline in the inflation of food articles including cereals and pulses is an indicator that the government has rightly focused agriculture sector " Anil Khaitan President PHD Chamber was quoted as saying in a statement. "Going ahead we look forward to the continuation of favourable policy environment and further easing of monetary policy to strengthen the industrial growth and lower cost of borrowings for the businesses especially for the MSMEs." 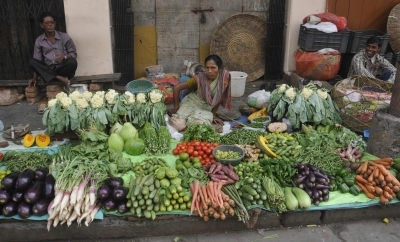 Sunil Kumar Sinha Director Public Finance and Principal Economist India Ratings said: "Unlike the retail inflation which dipped by 16bp in March 2018 over the previous month the wholesale inflation remained flat." "However there are some noticeable changes at the disaggregate level. Inflation in the food article category which has been declining since November 2017 turned into deflation in March 2018 mainly driven by the sharp correction in the prices of fruits and vegetable." Aditi Nayar Principal Economist ICRA said: "A downturn in food and mineral prices helped to offset the unfavourable base effect and keep the wholesale inflation steady at 2.5 per cent in March 2018." "After the surge seen in the previous month the core-WPI inflation eased to a three month low 3.6 per cent in March 2018 from 3.9 per cent in February 2018 reflecting a favourable base effect as well as the trend in a number of sub-sectors with a substantial weight such as textiles basic metals fabricated metal products and motor vehicles trailers and semi-trailers etc."